The UK braced itself for storms on Sunday night. There was much comparison, before the fact, with the "hurricane" of 1987. 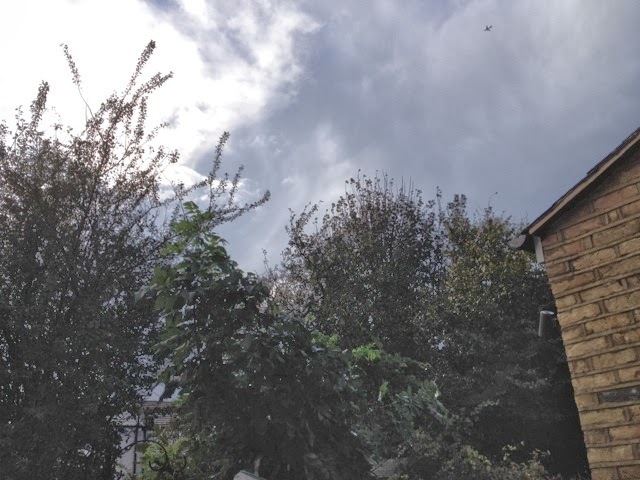 It wasn't really a hurricane, but Michael Fish (famous weatherman at the time) on the lunchtime bulletin reassured a caller that there wasn't a hurricane on the way. As it goes there was no comparison. It was unseasonably windy Sunday into Monday. We lost a tree, and our patio table made a bid for freedom. 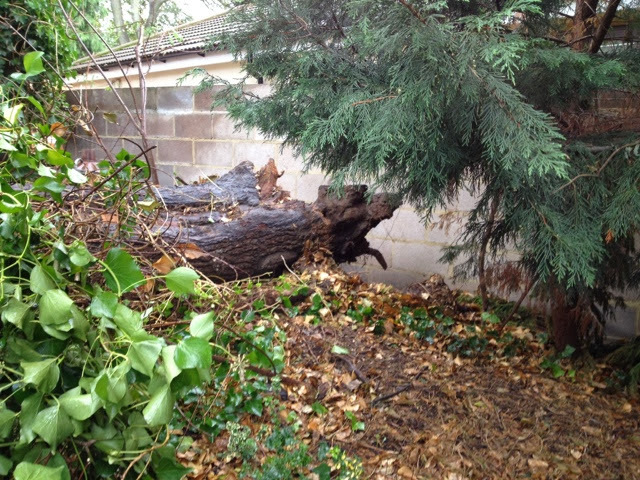 Tree down, uprooted (not helped by evil wall builders who butchered the roots). The wood pigeons loved the berries, little birds lived there, squirrels played there, and, most importantly it blocked the view of the wall and building over the wall. The patio table made a bid for freedom. 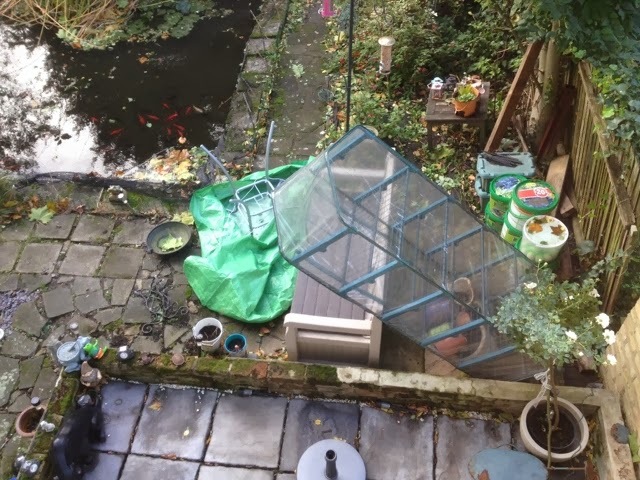 It took out the bird-bath too but that was only dismantled not broken. Amazingly the glass table was (apart from being upturned) unscathed, tempered glass is a great thing. When I noticed it from the bedroom window it was making a bid for freedom down the path. 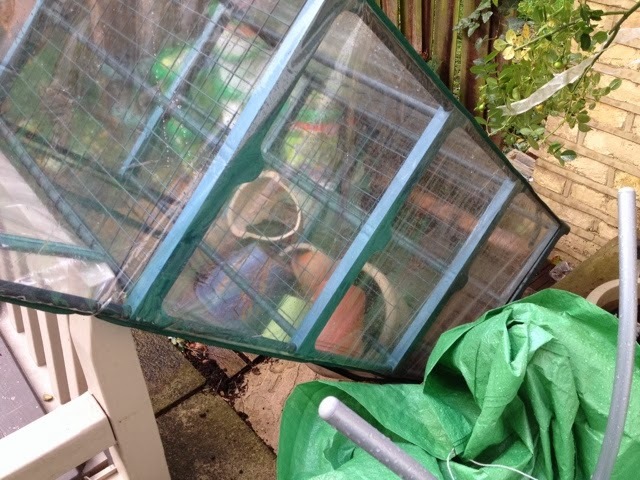 The greenhouse had already blown over and we'd left it down. Good choice in the circumstances. Wrong angle and the shelves drop out and it could have clown off like Dorothy's house in 'The Wizard of Oz'. The weather through the day was changeable. Grey and even raining to sunny skies. The constant was the wind, dropped from the night before but still gusty. We were lucky. We lost a dearly loved tree but that was about it. In London our power cables are below ground, we have cable for phones and TV so inside life went on uninterrupted. A good few services were shut down as a precaution; sensibly the Air Emirates cable car... less explicably (on Sunday afternoon) TfL's Overground.